You can save $1,000 on the Matterport Camera until 11:59 pm on Friday 20 January 2017 with promo code - ICNY17 - says a Matterport flyer at Inman Connect New York 2017. Any thoughts about why Matterport is discounting its Camera by $1,000? The last discount I am aware of was $900 through 30 November 2016. Why is Matterport discounting its Camera? I'm at the checkout now looking at this ..
My total for 10 cameras is $45K. The strange part is that the 41000 promotion code appears to be for anybody who visits the Matterport site. I don't recall seeing such a substantial promotion code printed right on a site's purchase page. Often a promotion code is only known by certain people. 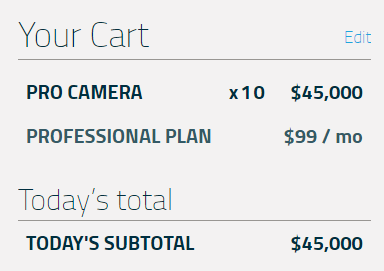 I assume that the sales page would subtract $1000 from each camera when I get to the final checkout page. That would drop the total price by $10,000. I'm not going to click "Submit" to find out but there seems to be nothing stopping someone from purchasing 1 or more cameras at the discounted price and reselling it for less than $4,500 after Jan 31. I'll chalk this one up to a promotion since 1) I didn't know about it until you revealed it and 2) the sale is only for 13 days. Maybe the subscription revenue and model processing fees provided by new camera owners could offset to a degree Matterport's $1000 loss. I just bought my camera at the end of December. I could have saved $100 by waiting until January. What a scam!! If you are within 30 days of purchase, ask Matterport Support for a $100 credit or ask them for shipping instructions to return your camera. It's likely they will credit your account. Please share the results here. Since the offer expires this Friday, I encourage you to reach out to Matterport Support today. And, please let us know what happens. Double dog dare you to complete the checkout. Hey, I'm planning on getting a PS4 in March despite the prices being better on Black Friday and the game deals being better. Thing is, my son's birthday (and my birthday) don't always align with the best deals. Please post if Dan's suggestion to request a $100 credit work out for you. @Metroplex360,everybody knows that companies usually offer seasonal deals and everybody knows that these are the rules. But this is not the case under discussion here. Matterport's case is different. They have been discounting their cameras the whole year and now they have increased their discount. Telling their customers that a certain discount is valid until certain date, and increasing the discount immediately after that date is not exactly a scam, but is a dissapointing behaviour that doesn´t help to create trust between its customers and the company. Only a company with no ethics, or a desperate one, could behave in this way. They are not getting the numbers they anticipated to their investors....this is the reason why they look so desperate. Maybe there is a new camera in the pipeline, but I wouldn´t bet on it as being the main reason for this deep discount. I'm not going to click "Submit" to find out but there seems to be nothing stopping someone from purchasing 1 or more cameras at the discounted price and reselling it for less than $4,500 after Jan 31. @UserName for the sake of your financial stability, please don´t bet on purchasing at $ 3,500 and selling back after Jan 31 for something less than $ 4,500. It is not going to happen! Matterport pricing strategy is erratic or guided by neccesity, not logic. Prices genuinely drop in technology when a new one replaces an older one, or when a new competitor comes to town. When it is because of a new technology, the price drop occurs immediately after the new launch (iPhone 7 replaces iPhone 6s and the 6s has a reduced price, and so on). But until the very same day of the announcement, the previous phone retains its original price. Unless you have plenty of stock about to become obsolete, but still, you can unload your stock after the annoncement with a deep discount without hurting your brand and your image. New competitors? Could be that Matterport knows something that we don´t know. I have been to the CES and I haven't seen anything that could represent a threat to Matterport. Of course there are many new 360 cameras out there, some of them very good indeed, but no one offers the "dollhouse" view, the smooth high quality transition that Matterport does, etc, etc. I wouldn´t bet on a new competing technology yet, but I keep my options open, of course. Should you buy a camera at this discounted price? Mmmm I would adopt a "wait and see" strategy. At least for a couple of months. @Metroplex360 - with 10 cameras I could start my own agency and teach people how to go out and scan homes once I learn to do it. Apparently the hard part is finding enough clients to keep 10 photographers busy all the time. Client's have to be out there because people buy and sell homes all the time. The solution is to do "X" better than the competitor does. X is marketing. @jfantin. I got hit by the iPhone 1 incident so I know what you're talking about. Not long after I bought the first iPhone, iPhone 1, Apple announced a cheaper better iPhone 2. That caused an uproar so Steve Jobs gave all iPhone 1 owners a $100 Apple Store credit. When Apple released iPhone 1, they had to know that iPhone 2 release date was just around the corner. These days I think you're right. Companies may not reimburse us because we bought something and a better something comes out later. I rarely find that I need to be in two places at once, and I personally am very satisfied with the level of business that I receive -- so yes, I'd agree that the hard part is to keep 10 cameras busy all the time. And I agree with X too. It's JUST a $100 discount. For my market at the price I sell my tours for, I just don't see this as a big deal. There are likely just as many people excited about this as there are upset. @Metroplex360, I was talking about the $ 1,000 discount, not the $100 difference between the original discount and the new one. Although increasing the discount doesn´t look good either. The key issue here is the fact that Matterport has evolved from a $600 discount to a $900 and now to a $1,000. If we were talking about summer clothes in January, well, I would agree with Matterport marketing strategy, but this is not the case. They are alone in their niche, no other technology is challenging their position, and they keep offering deep discounts...for me it is difficult to understand. Either we are witnessing the result of an strategic genious executing a very smart plan, or they are facing problems that we don´t know. One thing to note is that I'm getting all kinds of "Kick off 2017" deals in my email. Magix until Jan 4 was offering to sell me photo editing software for up to 83 percent off. The makers of Dragon Naturally Speaking offered to sell me the latest edition for 66% off. My mailbox is full of promotions like that which "celebrate bringing in the new year." My marketing question is if realtors really BELIEVE VR can increase their profits, why doesn't every realtor use VR? I think every driver who sees a cheaper gas station will choose the cheaper gas station because they believe cheaper prices benefit them. And, how can we prove a particular home sold "faster" using VR promotion? A home sale is a one-time thing. Lots of sites say VR helps you sell homes faster. They offer no proof of that. A few site stats, but where do the stats come from. Finally, maybe realtors might believe VR "can" help sell a home faster but is that guaranteed? If not, realtors may put VR in the "maybe but not right now" category. There has to be a reason why every realtor doesn't use VR "if" they truly believe they'll profit from it. I guess we can call that reason Y.
I absolutely agree. Matterport's asking price of $4500 is reasonable considering the exclusivity of the system and the potential application of the device. Apple's approach has never been to decrease prices, but instead to offer additional value in newer models. I'm not upset by the price decreases, but I do not welcome them as I do not believe that they serve a long term purpose. If they have been proven to stimulate sales by internal Matterport data, well, ok, good job. If not much, then I really would love for them to find a permanent fixed price point. As Dan said -- lower prices make buyers wary of 'what's next' -- and it almost might make buyers think that deeper price cuts are in store in the future. Thanks for the post, I was able to get a $100 credit. I bet they will have a deal for February also. They have been running specials since last summer. I think they need to quit calling it a sale and just say what it is.....a lower price. I haven't heard a word yet. Who did you speak with lknbigfish? This is exactly what I was talking about the price is still discounted. This is for $900 off. They had a pixel on the page I looked at to see if they had any discounts listed after I saw this post the other day. They retargeted me! I think I sent my request to the wrong customer service email. I did get a response and received a credit for $100. I was interested in their customer support more than the money. I was happy with the response time once I emailed the right customer support dept. This has made me a little more confident in their customer support. I keep reading about how long it takes to get a response from them. Maybe they acted quickly because I threatened to return the camera. Any thoughts?